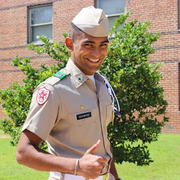 In November 2011, I (Akshay Shankar) suffered from an Avulsion fracture. My thigh ripped the corner of my hip apart and surgery was a must. Post surgery, my doctor didn't have the time to help me with personal exercises and I was financially incapable of affording a personal physical therapist. Faced by this dilemma I did everything from attempting to go advice from my own doctor, to my own intuition and the internet. Finally, I gave up on physical therapy altogether due to the lack of a credible source of training. Now, I face a blunt ache in my hip that I may have to live with forever. Just like the account above, the smartPhy team members have heard many friends of ours who have suffered Anterior Cruciate Ligament (ACL) tears, dislocations, etc. not pursuing long term physical therapy due to the high cost and time intensive nature of the care provided. Appointments need to be made sporadically over a long period of time, which some people can't afford. Meanwhile, people lack the motivation to perform recommended exercises themselves due to fear of incorrect form which may lead to permanent damage to the affected area. Our team believed that we have the technology and resources available to bridge the gap between patients and physical therapists. This was our motivation for smartPhy: to give all patients the equal opportunity to reliable physical therapy for their future quality of life. SmartPhy is a wearable that performs real time control and monitoring of the physiotherapy routine of the patient. It has two separate components i.e. the wearable and a mobile application. The mobile application is written for Android and acts as the first user interface for the patient. 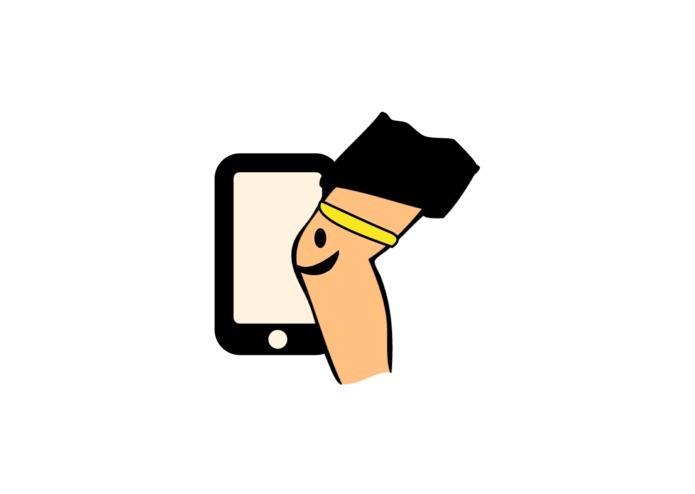 On the app, the patient can view his/her exercises (with video instructions) which are specific to the patient's post surgery physical condition and are recommended by the doctor. The patient can use the app to select a workout, switch and stop a workout at any time. At the end of a workout, the user can view details of the workout on the app like number of reps logged, total time taken etc. as well as the ability to notify the doctor. The doctor can use the provided information to have a reliable record of their patient's progress not solely based of their patient's account or memory. When the user starts a workout on the app, it transfers control to the wearable to monitor the workout. In addition, there is a transfer of data (initial and final configurations of the workout) as well which is performed over Bluetooth. Much like a physical instructor, it provides feedback to the patient to ensure correct execution of the exercises. 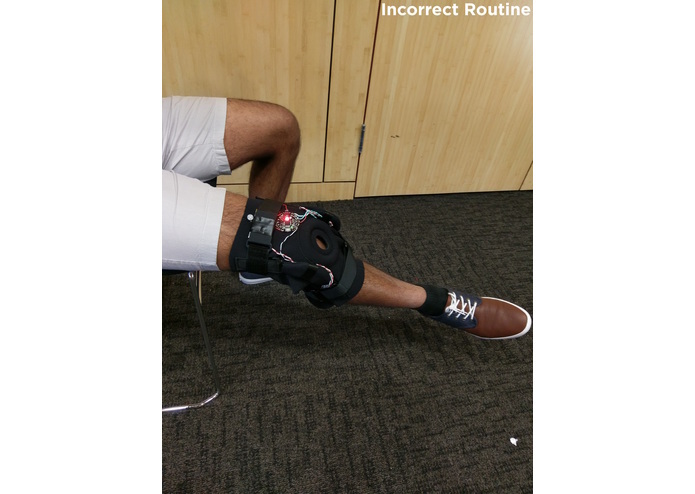 In its current form, smartPhy is a knee brace that with a mounted accelerometer such that it gives the angle of the patient's calf with respect to the knee. The two kinds of feedback in the SmartPhy are haptic (using a vibration motor) and visual (using an LED) which work together to notify the real time state of the patient's routine. All of data processing occurs on a micro-controller and the results are sent back to the Android app. 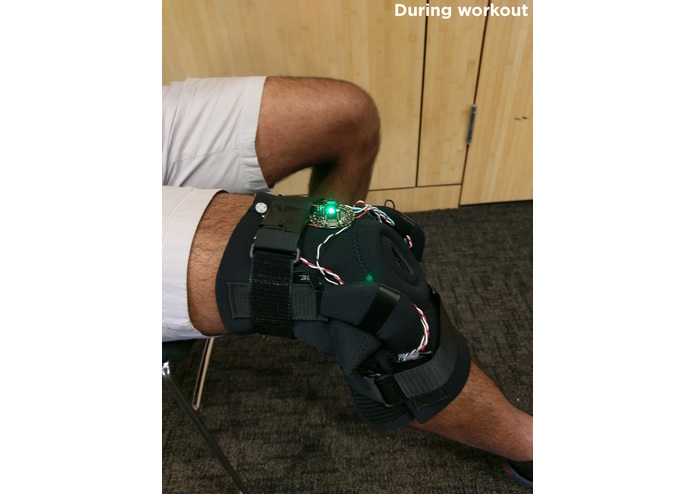 For our prototype, we used a knee brace to build the wearable with a bunch of hardware mounted on it. 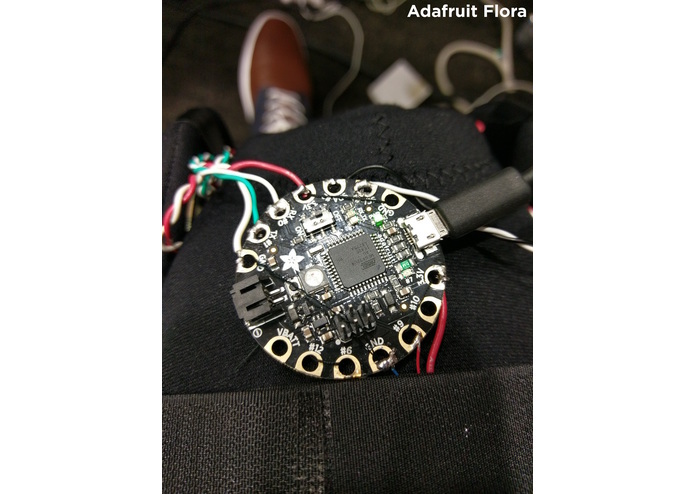 Specifically, we used an accelerometer (to measure thigh-calf angle), a low power micro-controller (Adafruit Flora), a Bluetooth Low Energy Module (low power Bluetooth) , a vibration motor (haptic feedback) and a Li-ion battery pack for the power. 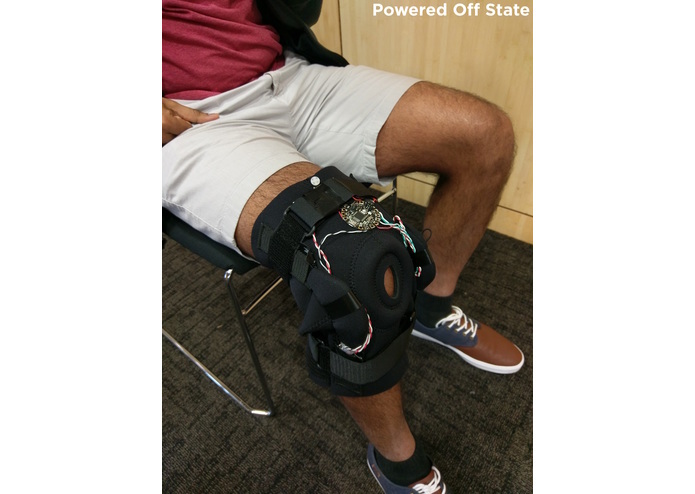 The hardware mounted on the knee-brace were either sewed or glued to ensure permanent fixture and repeatable measurements. For the app implementation, we used a lot of online resources available on Android and other sites like Adafruit. The firmware on the micro-controller consisted of a comprehensive state machine to allow for integration with peripherals, data processing and communication. One of the most difficult aspects in the project was getting Bluetooth communication to work between the Bluetooth Low Energy module and the Android smartphone. We spent nearly 5-6 hours to get it to work. 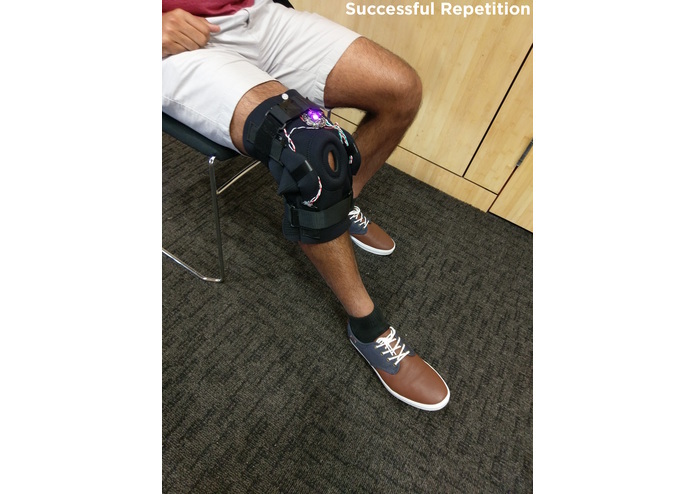 We also faced calibration challenges early on with the knee-brace because the accelerometer is very sensitive and each time we retook measurements, the accelerometer position would change resulting in very different values. 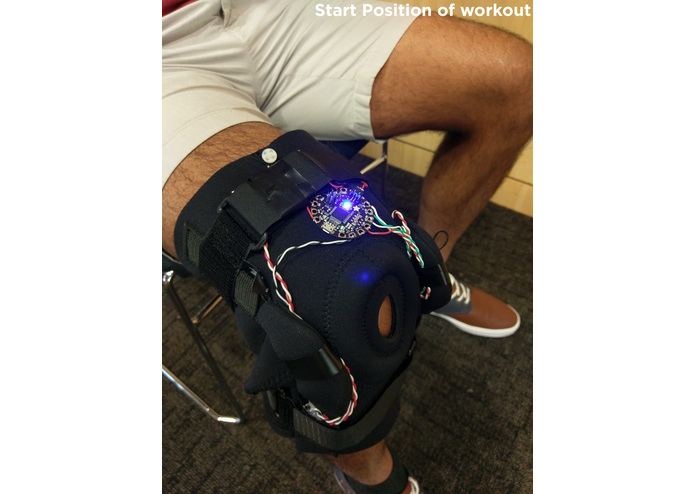 As a result, we glued the accelerometer to the knee brace ensure a permanent fixture. In addition, we wanted to create a user experience on the hardware and software side that would be simple yet descriptive enough to raise the patient's confidence and guide them towards a safe and productive physical therapy session. Working as a team under pressure. It took us a while to keep going (understanding different sensors, micro-controllers, Android etc.) and there were a lot of moving parts in the solution that kept breaking down. Even though each member worked on their unique agenda item for this project, we were able to integrate various systems piece by piece without much trouble, or refactoring. We knew that one of our biggest challenges would be to show that even in its first iteration smartPhy can achieve its foremost objective of safe & productive physical therapy for our patients. 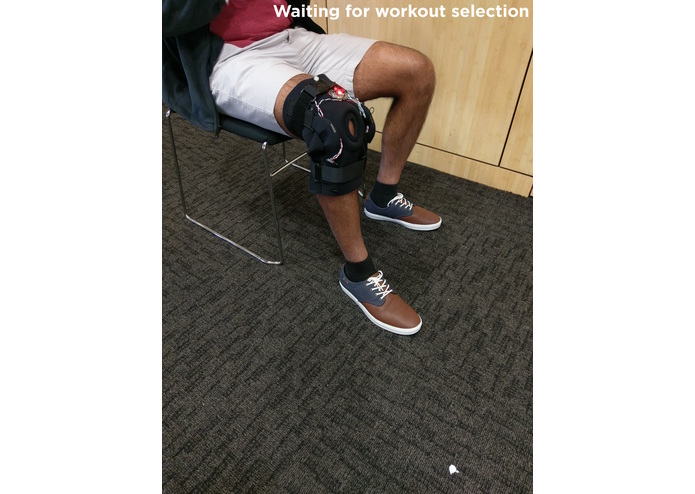 We are pleased with smartPhy's simple yet effective real time feedback to its user, where it doesn't give too much room for error while also guiding the patient towards a successful workout. Most of all, we are happy that we stuck together during difficult times that ultimately helped us achieve the prototype we envisioned at the beginning of TreeHacks. Hackathons are mostly about smart execution. Dividing up tasks and ensuring maximum parallelism will help greatly in overall project progress. It's okay to not have a perfect implementation- 36 hours is too less to build an amazing product. The idea is what matters. We will take a break first! Beyond that, we are really interested in meeting up and interacting with people who are passionate about providing affordable physiotherapy. We think this space has huge potential for disruption and would love to work with equally passionate people.